As mentioned earlier in related articles, functions written in other languages like R, matlab or ILNumerics can be integrated with table functions using the high-level constructs like function router1 and subtable transformer2. Following example scenarios demonstrate how different estimation functions written with the popular free and open-source language R can be applied on selected parts (i.e. 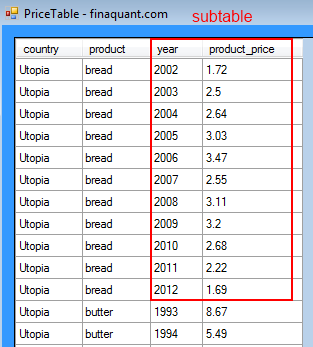 subtables) of an input table containing some historical data for price estimations. You can find all the relevant code in R and C# at the download page, including the C# code for generating test data. For the example scenarios below we have three estimation functions in R, all based on Linear Regression (LR) of the global indicators market index and oil price for delivering price predictions. Note that the details of the estimator functions (and whether they make sense in reality) are unimportant for the scenarios below. 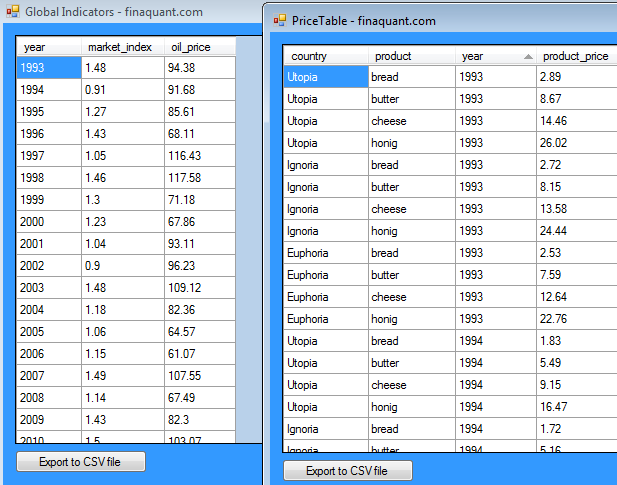 We will focus on the big picture and integration: How can we apply selected price predictors in R on selected subtables of an input table? See related article for the installation of R.NET that we use here for the integration of C# and R.
This example is designed rather for testing if the table function PriceEstimatorA() which envelopes the corresponding R function works as expected. 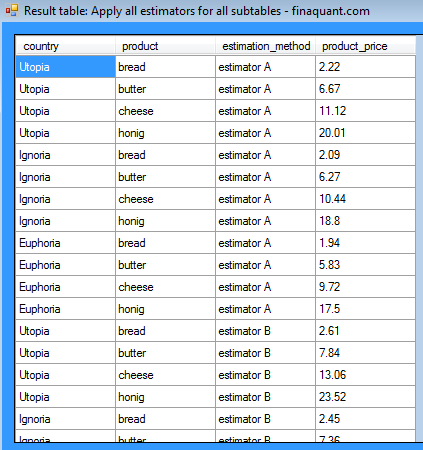 // apply table function on a single subtable for country-product pair "Utopia", "bread"
Yes, the table function PriceEstimatorA() works as expected. 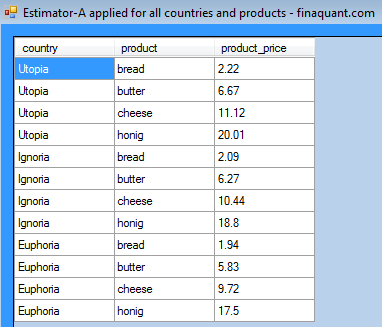 In this example, the same prediction function is applied for all countries and products. Applying the same table (or matrix) function on all subtables of an input table… This is what a subtable transformer is created for. This is where the fabulous function router comes into play. In the result table we want to see explicitly which estimation function is used to generate each estimation. 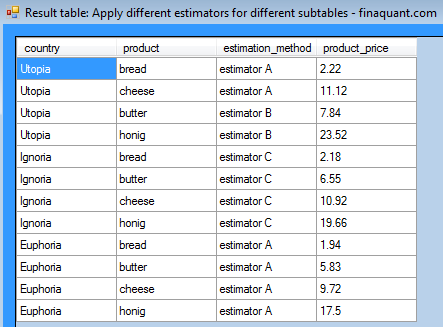 In this last scenario we want to apply all available estimation functions on all subtables of the price table in order to compare the estimation results. This is again a task for the function router. In this article we demonstrated how selected functions in R can be applied on selected parts (subtables) of input tables using flexible constructs like subtable transformer and function router. 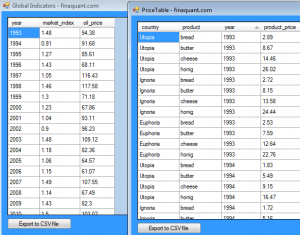 In that sense, these constructs can be used to integrate R with data tables containing any number of attributes and key figures. The same (or similar) integration approach can be used for other computing languages like matlab. This entry was posted in Calculation engine and tagged integration, predictive model, R. Bookmark the permalink.